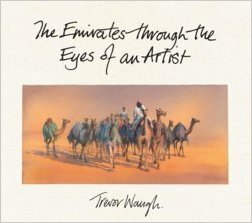 Trevor Waugh’s popular book ‘The Emirates Through the Eyes of an Artist‘. has become a best selling title in Dubai and the Emirates. There are a limited number of signed copies available from this site only. At present the original book can still be obtained from selected booksellers and of course Amazon. 1st Edition copies with an original artwork by Trevor in the front, can only be obtained here. Price £50 +pp. This beautiful book celebrates Trevor’s work and time in The Arabian Emirates and uses his sketchbook paintings extensively. Originally sponsored by HSBC to celebrate their 60th anniversary of trading in the Middle East. There was an exhibition at The Majlis Gallery, Dubai to accompany the publication, where Trevor’s work can be seen. The gallery also hosts The New Orientalist’s work which Trevor is a founding member. This beautiful book is in the Heritage series by Motivate Publishing and is bound in dark brown linen as a hardback edition with gold inscription and high quality dust jacket. The artwork plates contain hand written notes by the author as they appear in his sketchbooks. Published faithfully in accordance with Trevor’s wishes, this book is a celebration of his journeys, thoughts and feelings for the people and landscapes of this amazing region.